Here is another one of those mystery pieces that came in a 100+ piece estate lot. Most of the items in this gentleman’s collection (he collected for over 60 years) have strong provenance and/or hallmarks. So I am going to give this a good examination. First I will post photos of the item I am examining, then I’ll follow with the reference material I dug up on these large mosaic shell pendants. The necklace is 24 inches long and made of very nice turquoise nuggets that are strung on a metal wire. I am of the opinion that this is a married piece, that is, the more contemporary necklace was added or substituted later. Perhaps if this shell pendant originally came with a traditional heishi necklace and the pendant was attached to it with fiber or thread (as was done and you will see below in the reference section), the necklace or attachment might have broken and this was what the owner did to make it work. The shell pendant is is 5 1/2″ wide and 5″ tall. The shell is relatively flat. It is attached to the necklace by sterling silver wire. This might be a more recent evolution of the necklace ( see my comment above about married piece.) You can see where there were several attempts to drill a hole on the left to find one where the pendant balanced correctly. Remember this when we later look at one of the research pieces. The inside of the shell is mostly white with faint hints of peach. It is of the shape and size of a large spiny oyster shell. Here are some closeups of the inlay. Note the black material between the turquoise pieces. The white mosaic pieces appear to be Mother of Pearl but I am not sure if the black is Acoma Jet, old phonograph records or other substitute material. The reddish brown tiles are pipestone, a material that was noted to be used in the Santo Domingo pueblo (Baxter Encyclopedia page 156). Shell pendants are some of the earliest jewelry found in archaeological sites in Arizona. The Hohokam, Salado, and Sinagua peoples obtained the shells by trade or travel. The shells are native to the Gulf of Mexico or the Pacific Coast. Prehistoric people used lac or pine pitch to adhere the mosaic to the shell. lac – a resinous substance secreted as a protective covering by the lac insect, used to make varnish, shellac, sealing wax, dyes, etc. Pine resin is a clear sticky substance secreted by damaged limbs or roots of pine trees. The resin can be used as is or made into a more useful pine pitch or pine tar which is black. 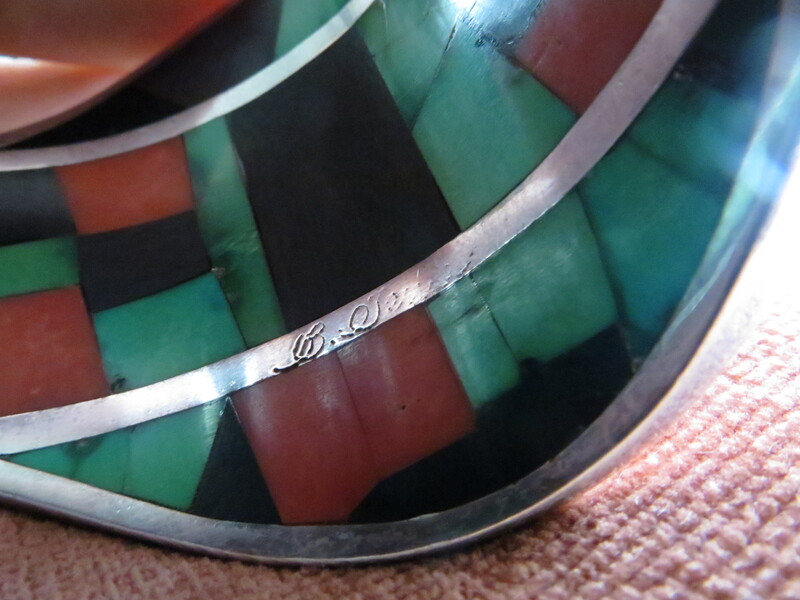 This tradition of mosaic inlay on shells is associated with Santo Domingo (Kewa) Pueblo of New Mexico. The contemporary revival of the art form is mainly due to Angie Reano Owen. Santo Domingo artists Mary Coriz Lovato and Jolene Bird also makes mosaic inlay on large shells. Today the main difference is that black epoxy glue is now used instead of pine pitch. Note that this pendant is suspended from the heishi necklace by a fiber tie. There are several holes drilled in the shell to allow this. This necklace is said to be from the 1920s. This is a married piece. The necklace is more contemporary and was added later, attaching the pendant to the necklace with sterling silver wire. It is based on the proper size and shape shell. The adhesive between the turquoise is black which is traditional, whether pitch or glue. Pipestone and Mother of Pearl are associated with Santo Domingo work. It is possible the color of the base spiny oyster shell was faded or off color, so the artist decided to add the pipestone mosaic to brighten up the piece. The black material is unidentified at this point – it could be jet or an old record or car battery. What do you think? Please leave comments and additional reference information below. 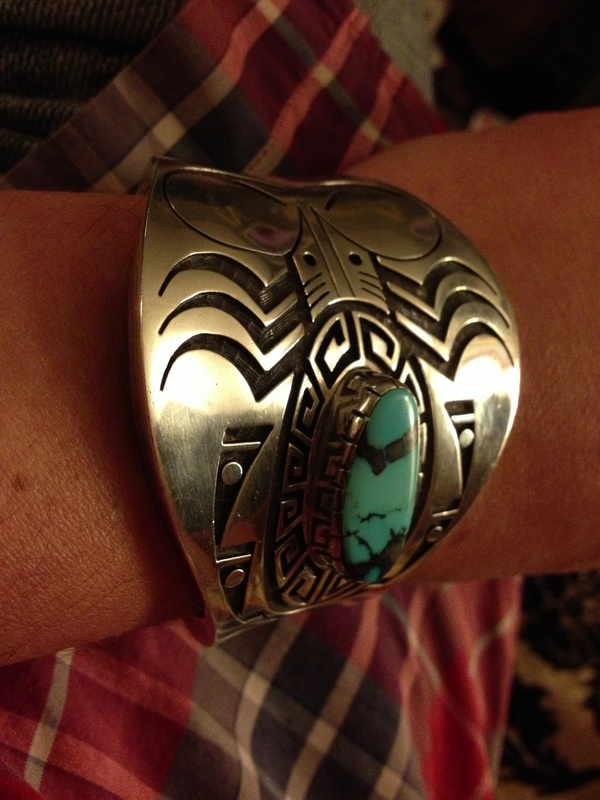 Most Native American jewelry is made from sterling silver which you can read about here. This particular concha belt made in the 1950s by Kewa silversmith Herb Coriz is made from pure silver ingots. Thus it is stamped .999 rather than the .925 for Sterling Silver. However, he made the buckle, which receives the most stress, from sterling silver.